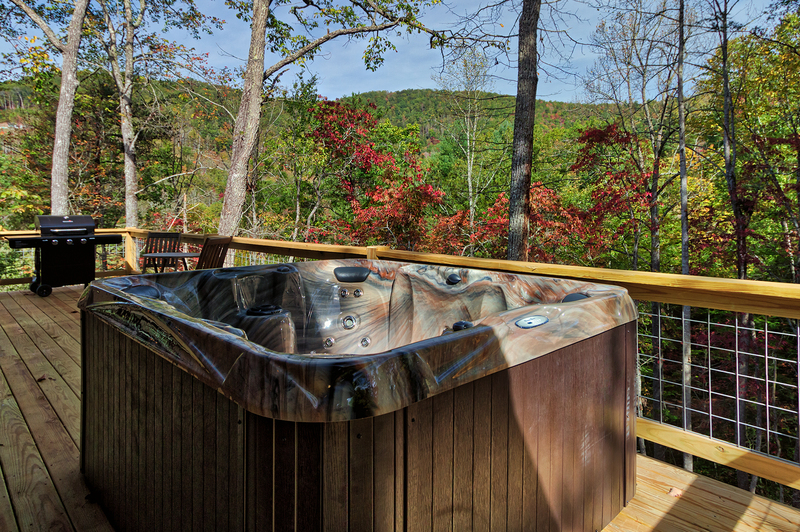 After spending a day exploring the smoky mountains on foot or horseback, your muscles will enjoy a dip in the hot tub on the deck. The back deck is sheltered from the afternoon sun or the occasional rain drops. 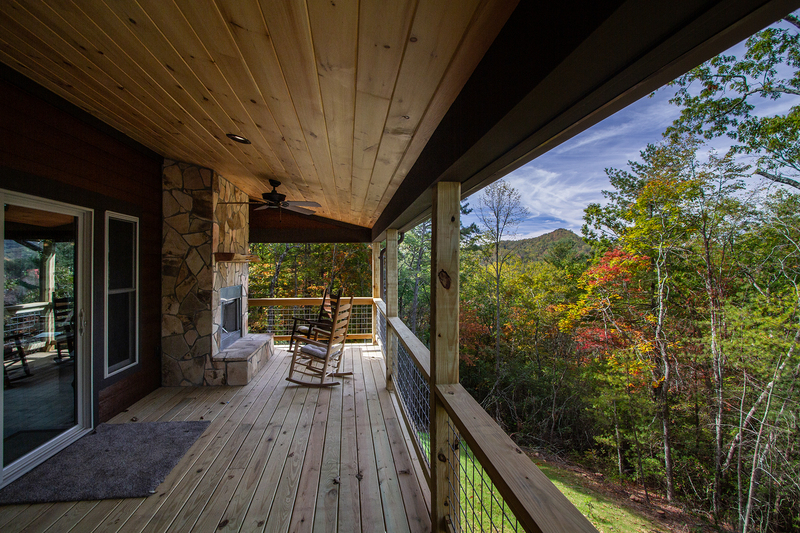 The most popular spot to relax on the back deck is in front of the wood burning fireplace. 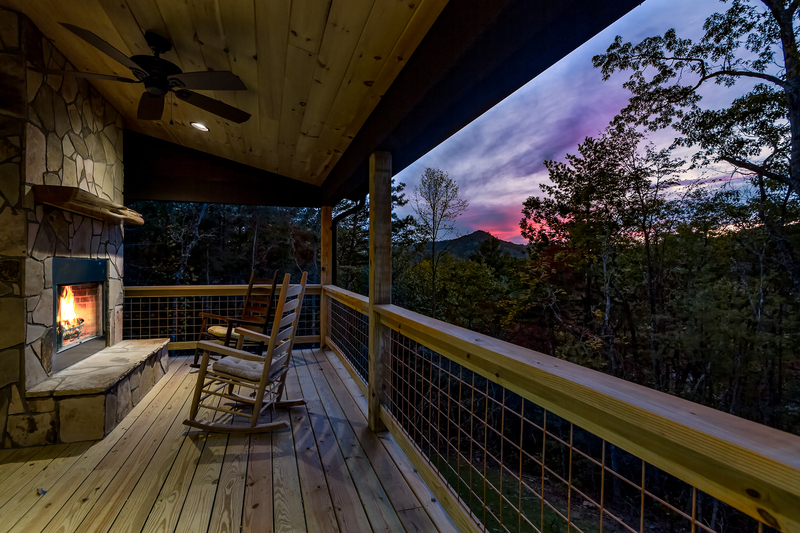 Watching the sun set while sitting in front of a wood burning fireplace can be a memorable experience. 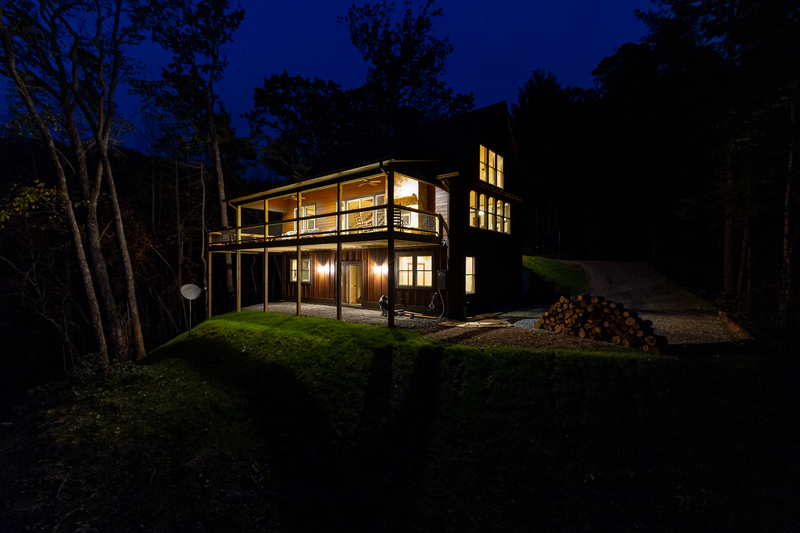 The back of the cabin and upper deck glowing in the night time air. The kitchen is just a few steps in from the front door. The master bedroom has a king size bed. flat screen TV, and adjoining private bathroom with standing shower. A private entrance offers quick access to the outdoor hot tub. 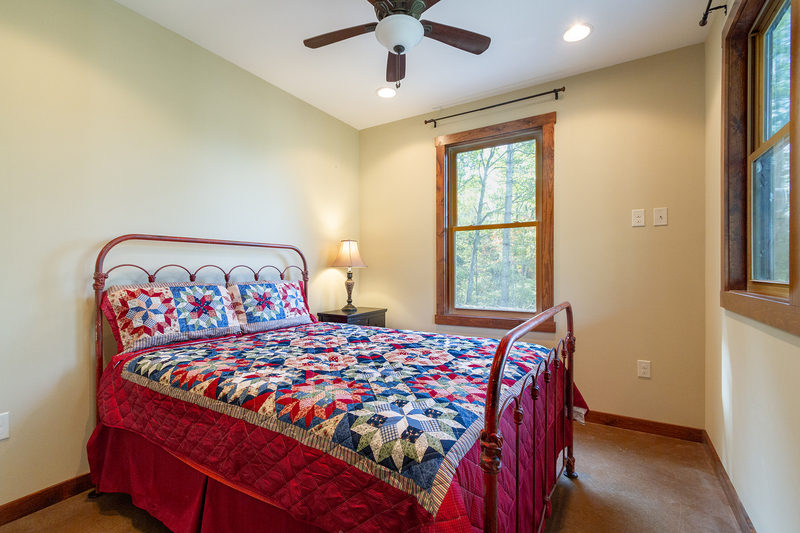 The second bedroom is on the lower level and has queen size bed. 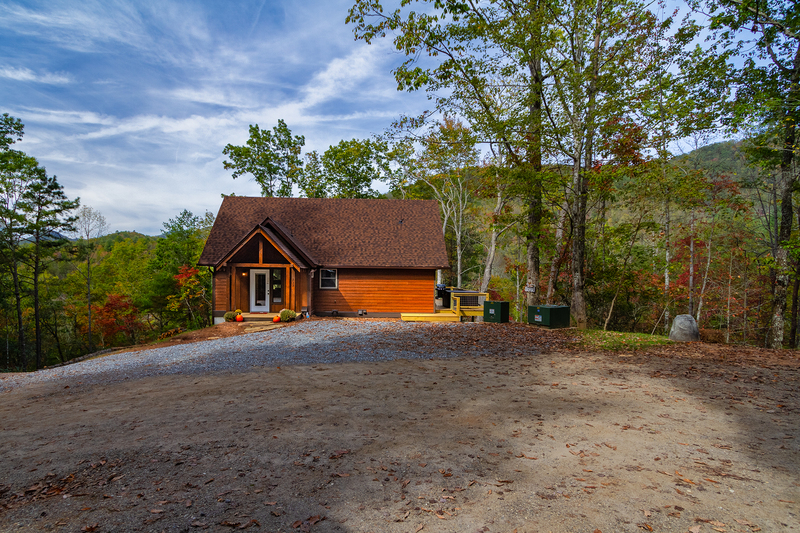 Chillin’ Time is beautiful cabin that sits secluded in a quiet forest above a picturesque mountain valley horse pasture bordering the Great Smoky Mountain National Park. This beautiful corner of the smoky mountains is known as The Settlement at Thomas Divide. 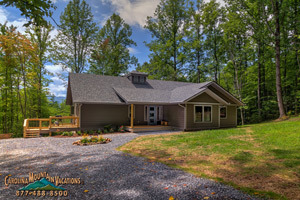 Guest staying at Chillin Time can rent the use of a horse paddock for a small fee of $15 a night per horse. Please visit the Thomas Divide page for more information if you would like to bring your horse on your next vacation. The Thomas Divide horse and hiking trail in the National Park is just a few minutes horseback ride from the pasture. 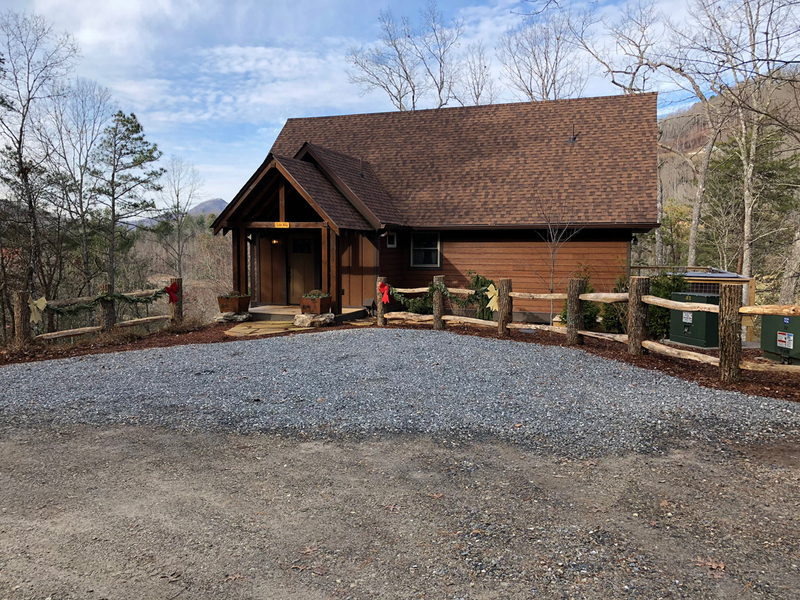 A beautiful short scenic drive past the Thomas Divide trail head takes you to the Deep Creek entrance of the Great Smoky Mountains National Park. In Deep Creek there are three spectacular waterfalls to hike to and the creek itself is a popular creek to tube down in the summer. 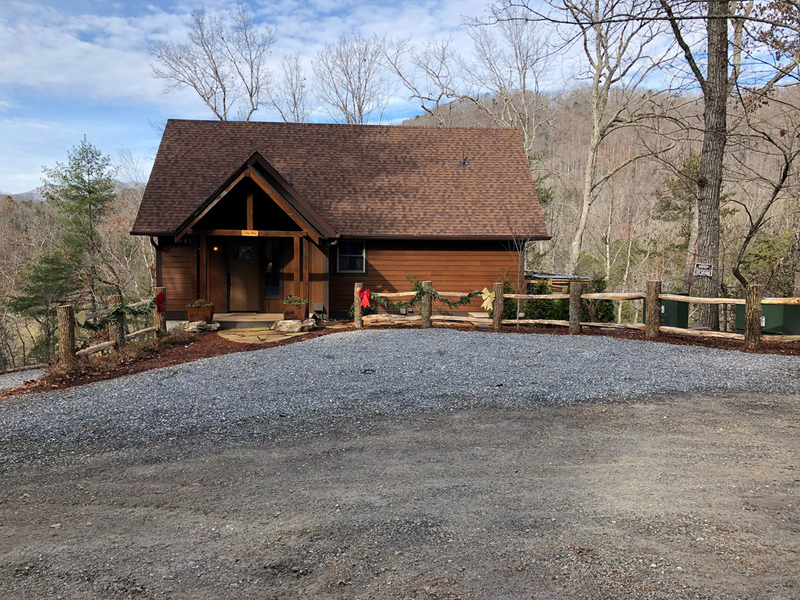 This cabin is conveniently located 10 minutes from downtown Bryson City, where you can enjoy the shopping, dining, and entertainment that the town has to offer. The Cherokee Indian Reservation is a short 15 minute drive away, where you can access the Harrah’s Casino, the Oconoluftee River fun and more! If you want a little more excitement, white water rafting on the Nantahala River is about 25 minutes away. 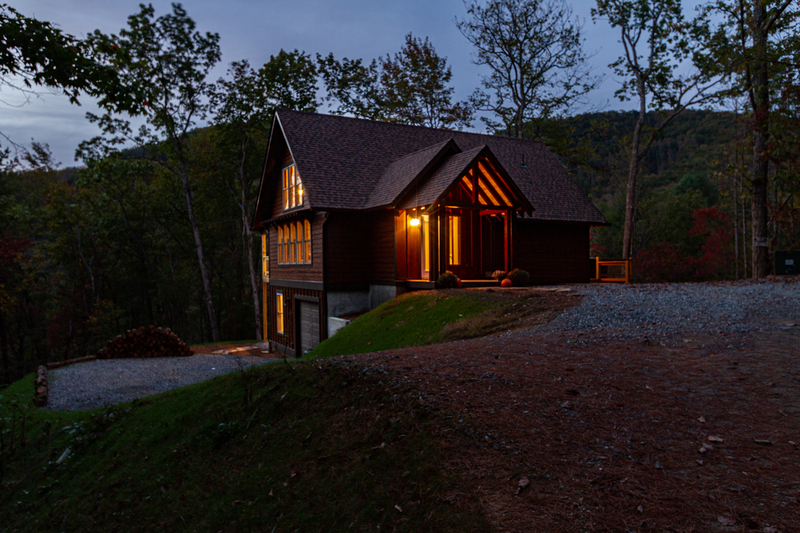 Chillin’ Time is a newly constructed multi-level mountain cabin. 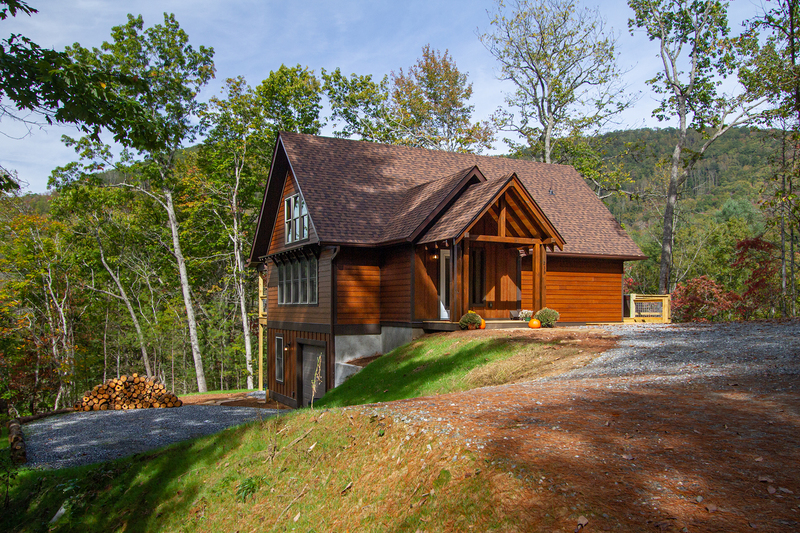 It has a wide flat gravel driveway with ample space for parking. 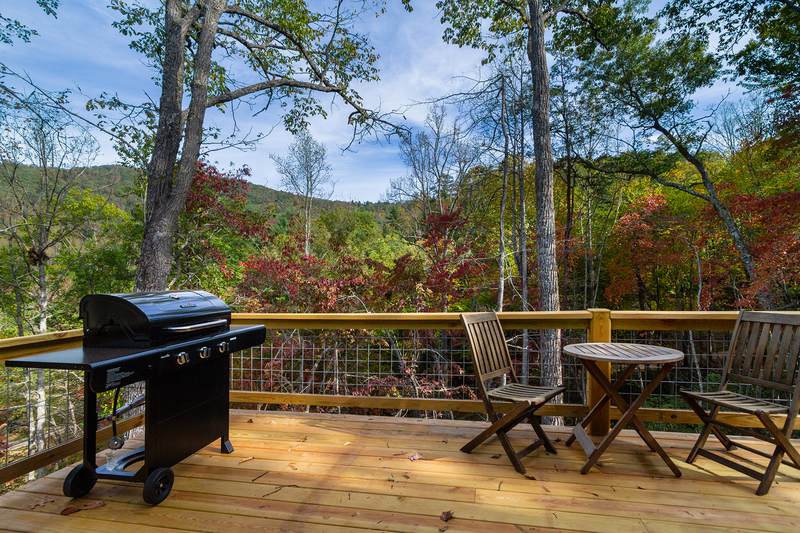 You can easily access the side deck from the parking area of this cabin, where you will find a relaxing hot tub and a gas grill awaiting your arrival to cook your favorite meats. 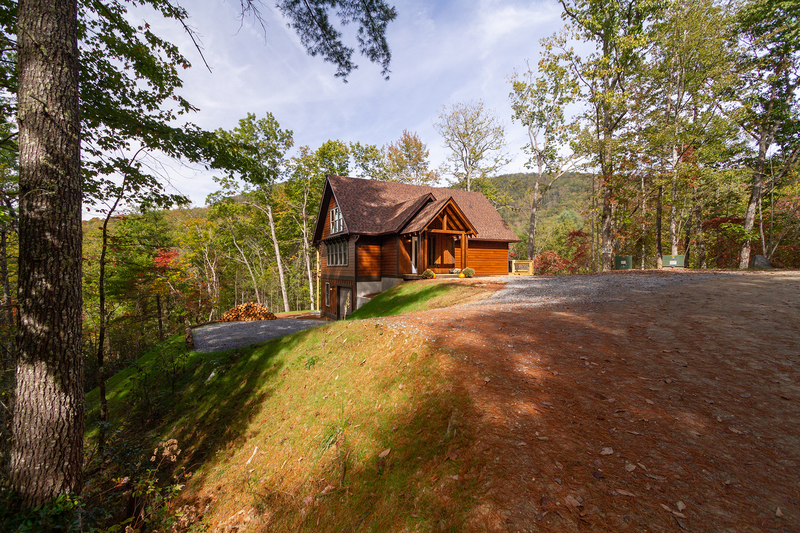 The back yard steeply descends into the smoky mountain forest that surrounds this cabin. 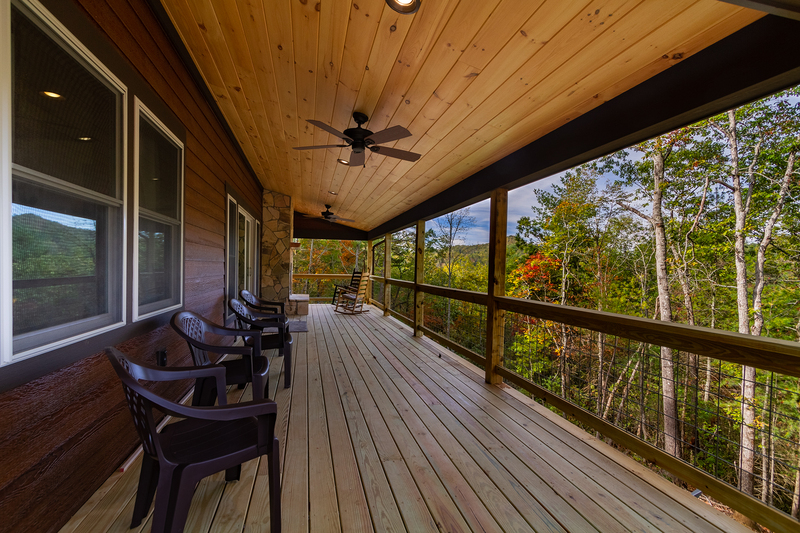 The private secluded back deck is where most guest spend the majority of their outdoor time. 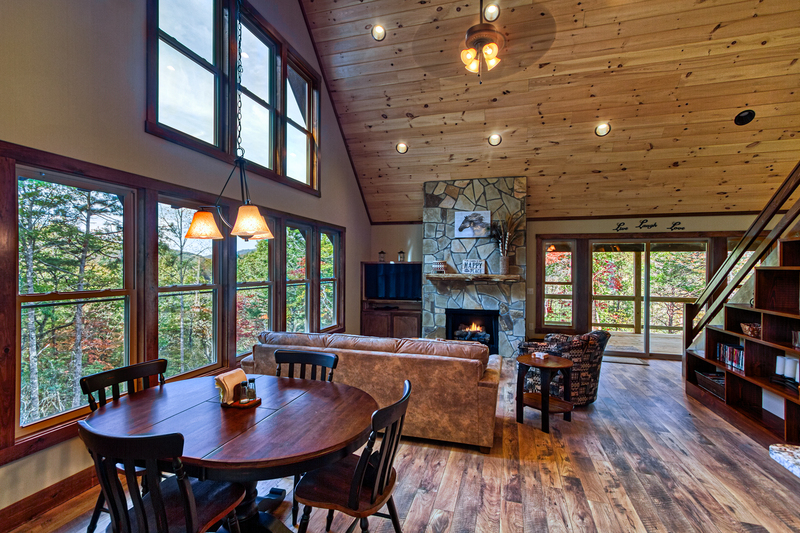 Here you can warm up by the wood fireplace or just chill out in a rocking chair and share your favorite beverages with friends while enjoying the forest fresh mountain air. 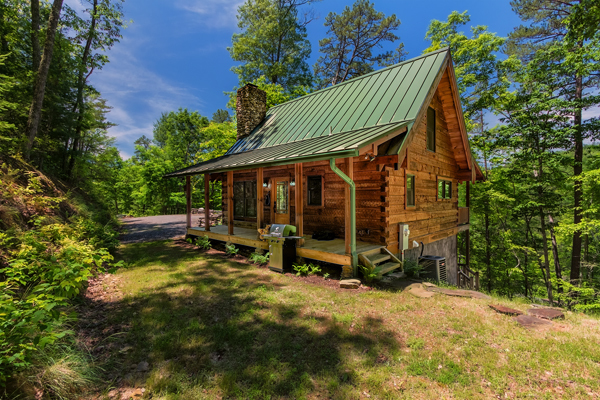 The view is forested and overlooks the beautiful horse pastures that lie below this cabin. Stepping through the front door you will immediately feel relaxed and ready to chill. 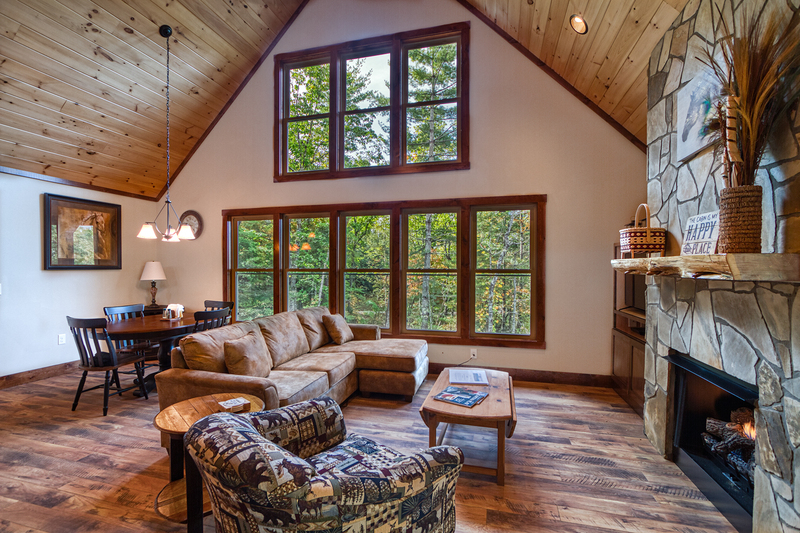 The high ceilings and abundant windows create a spacious environment that is perfect for your vacation at Chillin Time. 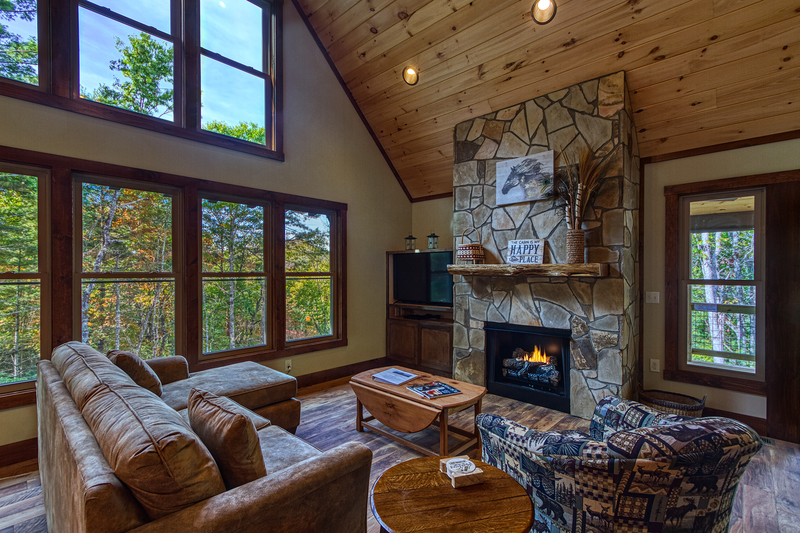 The living room sits adjoining the kitchen on the main level and is furnished with plenty of comfortable seating that is perfectly arranged for ample relaxation as you overlook the gas log fireplace and flat screen TV. 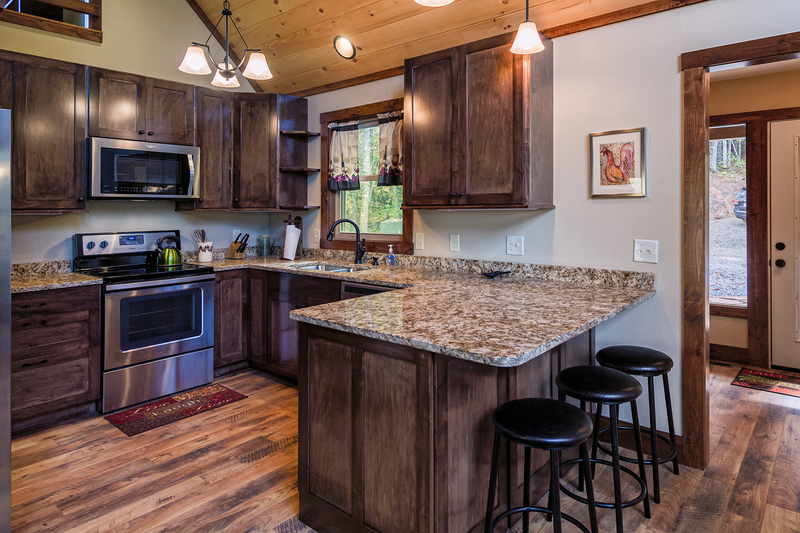 The adjacent kitchen is fully equipped with all the cooking conveniences of home. 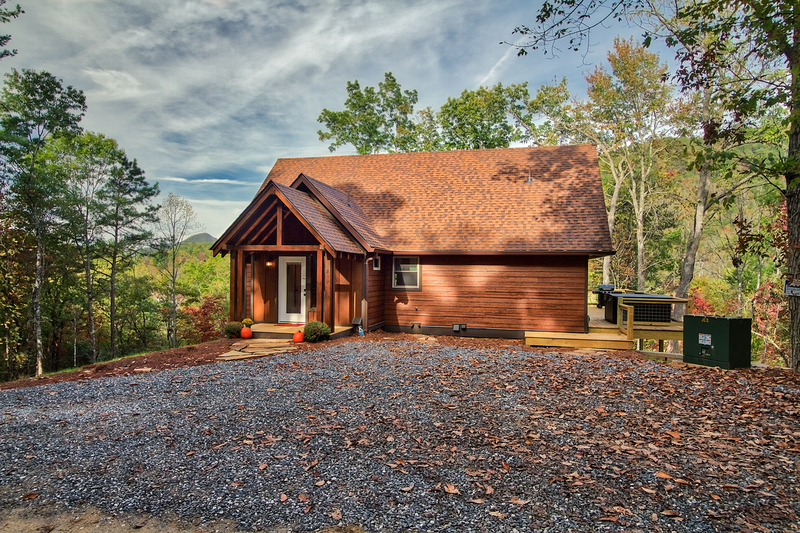 You will also find the master bedroom on the entry level of this cabin. 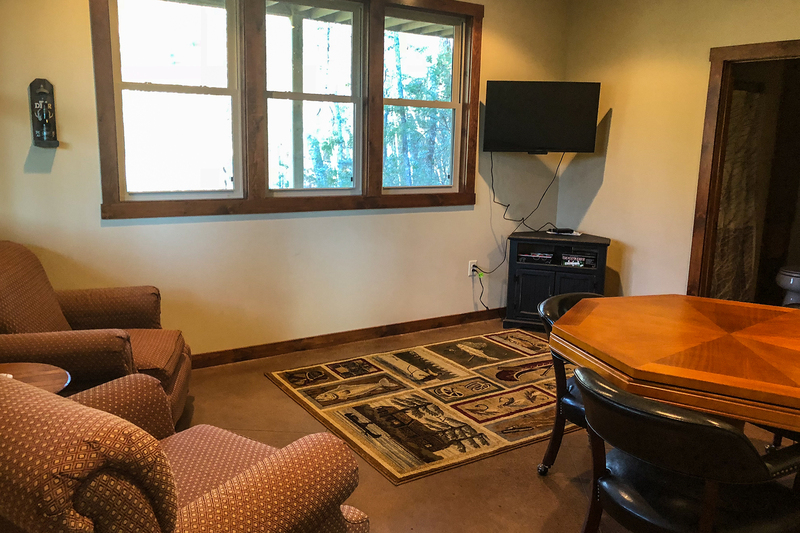 It is outfitted with a king size bed, flat screen TV, and a private entry way that will lead you onto the deck to quickly and conveniently access the hot tub from this bedroom. There is an adjoining private master bathroom with a standing shower and spacious walk in closet in the master bedroom as well. 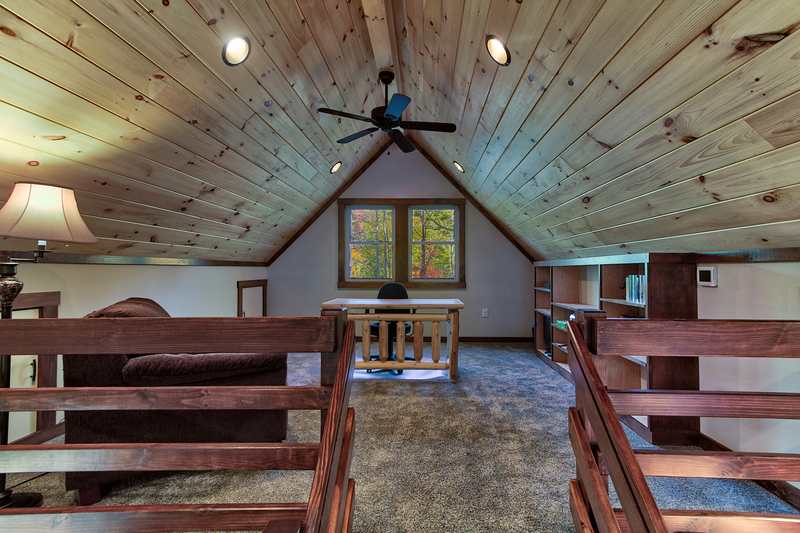 This cabin has a wonderful loft that is outfitted as a quite work space. Sit and read a book, or catch up on some work that just can’t wait. 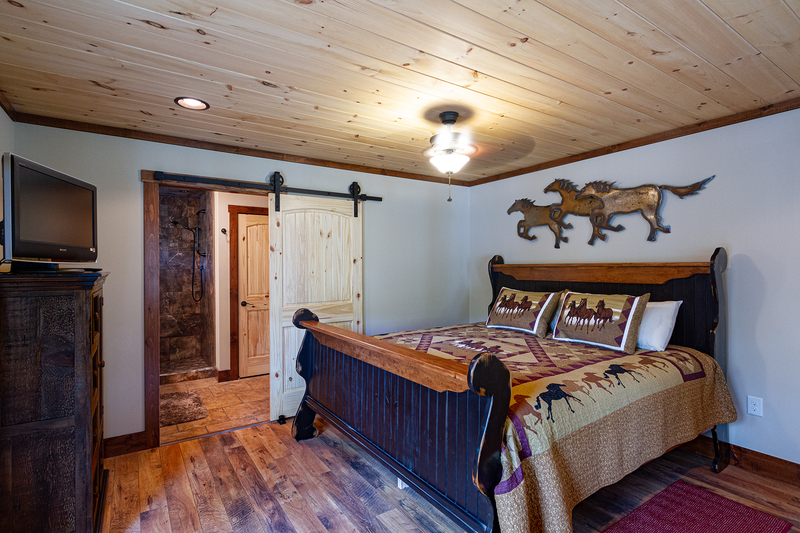 The lower level is where you will find the second bedroom furnished with a queen size bed, the shared bathroom for the floor, and the parlor room. The parlor room is outfitted with more comfortable seating for you to lounge around and enjoy watching the flat screen TV. There is also a card table that sits central to this room for your gaming pleasure. You can conveniently access the laundry room with washer and dryer on this lower level.